Texas State University's campus newspaper, The University Star, did an exclusive interview with me about OJ&B, my move to NYC and being press at Mercedes-Benz Fashion Week. Read the article below! Gone are the days when front row seats at fashion shows were exclusively occupied by starlets, socialites and the powers-that-be in mainstream media. 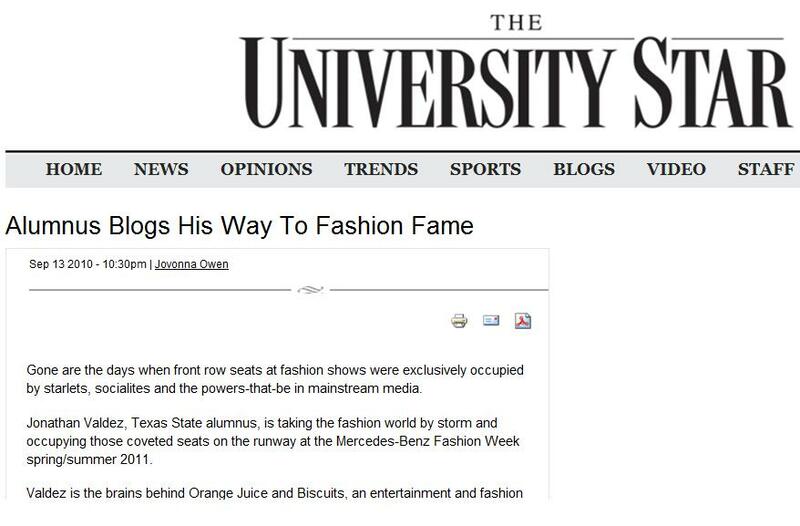 Jonathan Valdez, Texas State alumnus, is taking the fashion world by storm and occupying those coveted seats on the runway at the Mercedes-Benz Fashion Week spring/summer 2011. Valdez is the brains behind Orange Juice and Biscuits, an entertainment and fashion blog that started out as a KTSW radio program. Valdez’s show saw success with numerous awards in broadcasting and was nominated for the Top 10 Radio Morning Show by Austin360.com. Valdez used that success as a springboard, moving to New York City after graduating in Aug. 2009 to pursue a lifelong dream of being a fashion and entertainment journalist. Valdez said there is a change in the way people are getting news content. The road to success was not always smooth. Valdez changed his major to communication studies after failing the Grammar, Spelling, and Punctuation test required for mass communications majors. Valdez credits Laurie Fluker, associate professor in the School of Journalism and Mass Communication, for mentoring him through the difficult situation. Valdez said it was not all glitz and glamour when he first arrived in the city. Fluker is not surprised at Valdez’s success in New York. “He has that ‘Je ne sais quoi’ — that edge about him that makes him want to do the unusual,” Fluker said. Mandy Dugan, Texas State alumna, co-hosted the KTSW radio program with Valdez before his departure to New York City. Dugan said it did not take long for Valdez to take over the big apple. “In a couple of months he already had friends in the fashion world, a blog and was covering great events in the city,” Dugan said. Orange Juice and Biscuits was voted one of the “Top 5 Best Bloggers to Follow” in 2009 by Mashable.com. Valdez is no stranger to fashion week, previously covering the Donna Karan fall 2010 collection and rubbing elbows with fashion elites such as Anna Wintour, Rachel Zoe and Demi Moore. Valdez keeps his ear to the street covering up-and-coming fashion couturiers. “Indie designers doing their own thing is a lot more inspiring than some of the bigger collections,” Valdez said. Valdez is hoping to take his brand to the next level. Special thanks to The Univeristy Star and Jovanna Owen for doing a write up on Orange Juice and Biscuits! Also, I want to give a huge THANK YOU to Dr. Laurie Fluker and Mandy Dugan for saying such wonderful things about me! That was very sweet of both of you! View the online posting on The University Star website here.